Last week I was going to host my son’s 1st birthday party until 75% of my family got sick. I had already purchased all of the food supplies for the party as well which meant now… I needed to use it all up before it spoiled. So today, I offered to make my husband a batch of jumbo blueberry muffins to take out to training with him. I’ve made blueberry muffins in the past, but none of them truly got the rise out of them that I wanted them to. None had that true muffin top like you want in a blueberry muffin. But not these! These muffins rose up beautifully and have a nice, sweet crispy top that is worth of a jumbo muffin! 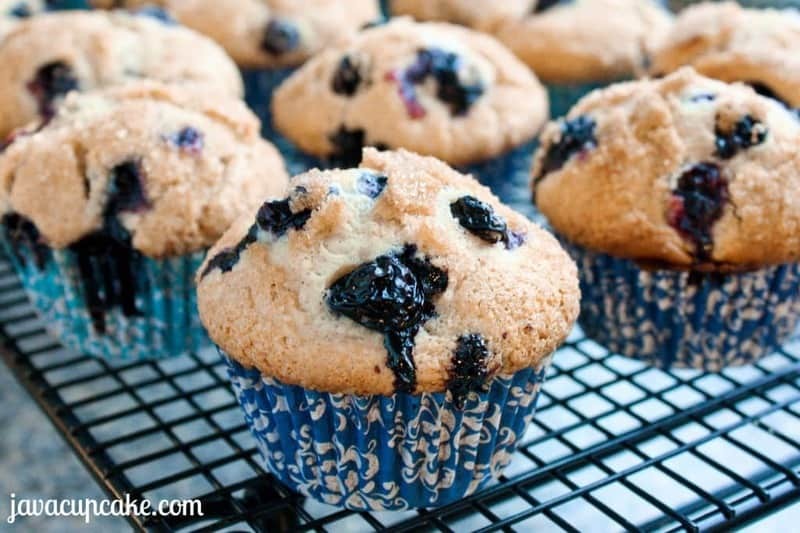 Packed full of fresh blueberries, these muffins are juicy and sweet and the addition of cinnamon adds a depth that’s unexpected in the flavor. And I call them Jumbo because of how much they rise and puff up out of their liners!! JUMBO-licious! I’m pretty certain that none of my husbands soldiers will notice anything other than the fact that they taste AMAZING. But ya know, I’m good with that. They’ll be happy and fed and off to train for war. It’s the least I can do. Preheat oven to 425 F degrees. Line muffin tin with liners. Toss 1 3/4 cups blueberries in 1 Tbsp flour. Set aside remaining 1/4 cup of berries for later. In a large bowl, sift together the flour, baking powder, cinnamon and salt. In another large bowl, whisk the eggs and the sugar together until smooth. Add the sour cream, milk, oil and vanilla and whisk again until smooth. Make a well in the center of the flour and pour in the wet ingredients. By hand, fold the two together just until all the dry has been incorporated. Do not overmix. Gently fold in the 1 3/4 cups of blueberries. Using an ice cream scoop, drop mounds of batter into each liner... filling them completely. It's okay if they look too full, they won't be. You want the muffins to puff up big! Using the reserved berries, press 1-3 berries into the top of each mound of batter. Sprinkle the Sugar in the Raw over the top. Bake at 425 F degrees for 5 minutes then reduce heat to 375 F degrees and bake an additional 18-22 minutes - or until the tops are golden brown. Cool in pan for a few minutes before removing to a wire rack to cool completely. These are beauties, Betsy! 🙂 My muffin recipes also tend to come out like flat topped cupcakes. These muffin tops are perfect. Thanks! That’s why I love this recipe so much!! I’m going to make it again with blackberries and lime soon!